If you've ever wanted to run for office — well, sorta — here's your chance. The Washington Nationals are looking for new recruits to join the ranks of the team's famous "racing presidents" mascots. WASHINGTON — If you’ve ever wanted to run for office — well, sorta — here’s your chance. The Washington Nationals are looking for new recruits to join the ranks of the team’s famous “racing presidents” mascots. If you think you have the swift-footed skills to fill the shoes of George, Tom, Abe, Teddy and Bill, you have until Saturday to apply online for a tryout. The auditions are set to take place Jan. 6. 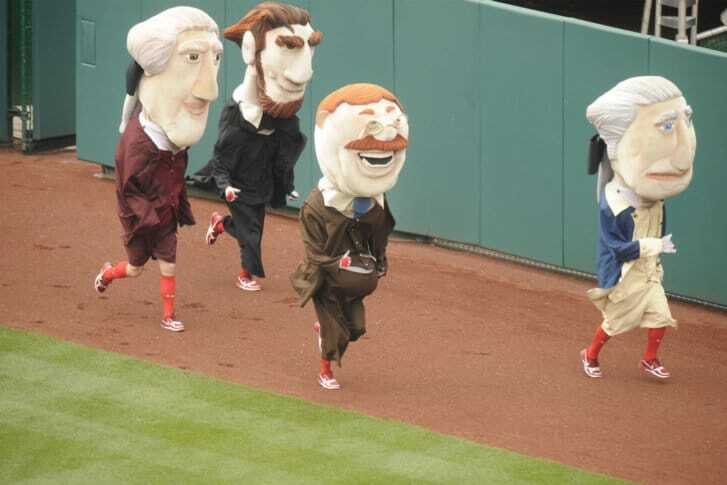 The presidential mascots, who have been a beloved part of the Nationals’ game day experience since 2006, race during the fourth inning of every home game. The team says those interested in applying must be at least 18 years old and have a high school diploma or GED. Previous mascot experience is preferred but not required, the team said.